Starting disc golf in the Kalamazoo Area, building courses and running leagues and tournaments! 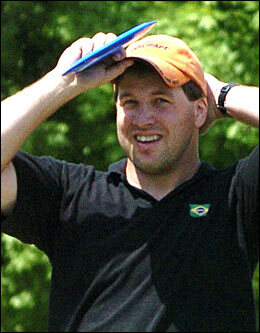 The experience as Tournament Director the 2008 Pro/Am World Championships. It was the second largest disc golf event to date. There were a lot of different experiences that were part of that event that will make that one of the most memorial times of my life. Confidence is the key to putting for me. How my putting goes is usually how my game goes and I have had many struggles with it over the years. I have found that I putt the best when have a more positive and confident attitude. Doing that is the hard part. Not getting down if you do miss or talking yourself out of the shot before you make it. With putting, the smallest hesitation or lack of confidence can pull your shot off just enough to miss. The best thing to help with my attitude is for me to tell myself that I am going to make the shot and that I have been making them all day. I will not even let missing come into mind. I don't get worked up if I do miss. What is done is done and thinking about it is going to bring me down and lower my confidence. I try and think about the shots that I have made. It is a good thing to do after the round. Don't tell everyone about the putts that you have missed, but tell them about the good shots you have made. A positive attitude helps to build confidence and that in return makes you a more solid putter. Most beginners that I see throw from down by their hip, instead of starting the throw from shoulder height. They lean back and throw in an upward motion, resulting in a shot that hyzers out quickly and doesn't have much body momentum behind it. To fix this problem, start out higher and lean into your shot, then follow through. This will allow you to get your body's momentum into the throw, plus you'll get a better flight out of the shot. Confidence is the key to putting and building your confidence in any way helps. Not thinking about missed shots. Tell yourself that you have been making 'these shots all day.' Visualize what you want to do and don't think of what happens if you miss. Any hesitation can make you pull your shot a little and that is all it takes to miss. Kalamazoo, MI I'm biased!!! Too many good times on these courses with friends not to be my favorites! Hastings, MI A really fun course to play! Challenging with a lot of chances to score well or blow up! Well taken care of by the local players. Wayland, MI Considered by a lot of people to be the best course in MI. This course has everything! Elevation, woods, open spaces, water, OB, long holes, short holes, etc. Allentown, PA I haven't played it since Pro Worlds was there. It was/is the kind of course that I love to play: big and difficult! Minneapolis, MN Played there for the Majestic, it was just a lot of fun to play! (174 gm) This has become my new go to driver. It goes as far as my Nuke does but is more controllable because it is just a tad more stable and I have fewer issues of turning it over too much and having it not come back. (174 gm) All I can say is wow!! They just go far. I use these for my distance driving. They go farther than anything I have ever thrown and I don't have to throw hard to do it. They added 40-50 feet to my game. I carry two of these as well as my go-to stable drivers. If I need to depend on stability I have it with these and the plastic feels good in my hand. (174 gm) I like Stalker for a longer turnover shot. Mine is a first run, I got it when they came out and have never replaced it. Probably my least used disc, but great for longer turn over shots or when I need something faster then my Buzzz. (178 gm) I like the feel and the stability of the ESP Buzzz. I carry two ESPs and use them to drive most holes. I can throw them 400 feet with accuracy, either hyzer, straight, or anhyzer. Just an awesome disc. (178 gm) I like these for turn over shots, shorter drives, and approaches. Less stable than the ESP Buzzz, it's the disc I probably throw the most." (174 gm) Versitile putter! Short drives, short approaches, and high wind putts, I'm using my Banger. It's really a comfortable disc in my hand and has reliable flight.